2010 is nearly over, so we’re taking the opportunity to look back at the stories that you, our Inhabitots readers, clicked on and read the most. From the shocking stats on lead in drinks designed for kids, to the wacky and wonderful ways to preserve placentas, the past year was filled with fascinating stories. 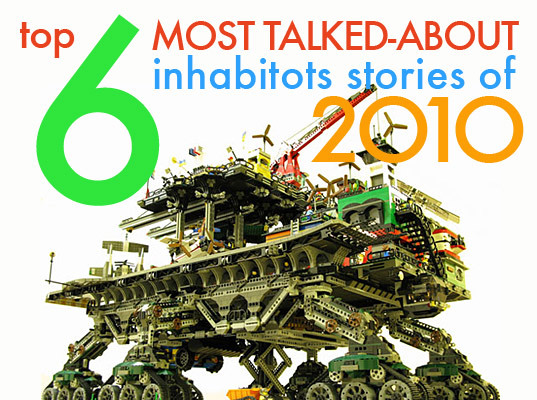 Here are the top six stories of 2010 posted on Inhabitots. Which one caught your attention most? Cast your vote! I had to vote for breast milk cheese, but seriously placenta teddy should probably win this one. I predict that people will be talking about that teddy bear for YEARS to come. The lead in kids' snacks is so incredibly frightening! 2010 is nearly over, so we're taking the opportunity to look back at the stories that you, our Inhabitots readers, clicked on and read the most. From the shocking stats on lead in drinks designed for kids, to the wacky and wonderful ways to preserve placentas, the past year was filled with fascinating stories. Here are the top six stories of 2010 posted on Inhabitots. Which one caught your attention most? Cast your vote!